Welcome to the SoundsOfSony Deal and Giveaway! 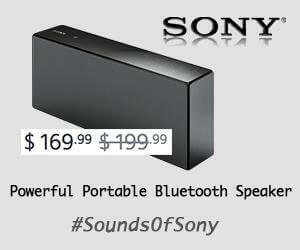 Sony is offering $30 OFF on the product of the week deal for portable bluetooth speakers. And they have some other products too on their Weekly Deals page with more discounts! Orders over $25 ship free. Restrictions may apply. Click Here for Sony’s Weekly Deals! In honor of The 57th Annual GRAMMYs this Sunday, Savings.com is giving 3 lucky winners a SONY Portable Party System w/ Bluetooth® & NFC! Giveaway starts from Thursday, February 5th at 12:00 AM ET to Saturday, February 7th at 11:59 PM ET. 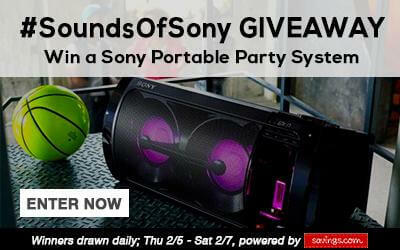 Three (3) winners will receive a SONY Portable Party System w/ Bluetooth® & NFC, each valued at $299.99. Users may enter once per day for each day of the giveaway, with the giveaway being reset at 12:01 AM ET on Friday (2/6) and Saturday (2/7); This means everyone can enter the giveaway 3 times! One winner per day will be chosen via lottery drawing and notified by email within 48 hours of each day’s drawing. Users can enter the giveaway by heading to the Sony page on Savings.com and submitting their email address in the form at the top of the page.